Also known by the name Thoothukudi, the port city of Tuticorin is located in the Indian state of Tamil Nadu. Word Tuticorin is the combination of two different Tamil words, “Thootu” and “Kudi”, which literally means, dig and drink. The main center for sea trading and pearl fishing in India, it is renowned for its unmatched quality of pearls all over the world; it is sometimes also referred as the City of pearls. However, it is not only the pearls which make this city so popular, but it is also known for its ports. Today, the port city of Tuticorin is also known for its Central Marine Fisheries Research Institute (CMFRI). Apart from these, this city has many more things to offer. For the people who love sea it is an ideal location. In fact, it is one of the most attractive tourist sites in Tamil Nadu. Some of the main attractions of this city are Roche Park, Harbor Park and Rajaji Park. These provide an ideal location for travelers and the locals for a picnic. 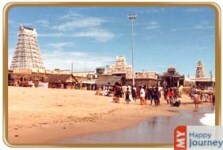 Apart from this another not to miss attraction is the Tiruchendur temple. Kalugumalai, prominent for its primeval rock cut Jain cave temple, surely leaves the visitors spellbound with the magnificence of art of the yesteryears. Some other sightseeing options are Thoothukudi Tiruchendur, Ottapidaram Ettayapuram, Thiruppathi, Korkai Athichanallur, Vanchi Maniyachi etc. Apart from all this, you can also visit the Kattabomman Memorial Fort. It is a fort which is dedicated to a freedom fighter of Tamil Nadu, Veerapandiyan Kattabomman, who participated in the freedom struggle against Britishers. The feelings that arise at seeing the fort dedicated to the real hero of our country cannot be expressed in words.